Harrisburg, Pennsylvania - Founded in 1996, the Central PA Oratorio Singers study and present classical oratorio masterworks for the audience of the 21st century, while faithfully respecting and embracing the intentions of their creators. "... an inspired performance of Mass Appeal"
Thank you choirs and orchestra! Stay tuned for our Fall 2016 Concert announcement. Click here to subscribe to email updates! Sunday November 15 ~ 3:00 p.m.
Rehearsal Schedule Announcement Singers - check out the calendar. You don't want to miss out on anything! Interested in singer with the CPOS? Check out the Audtion page! 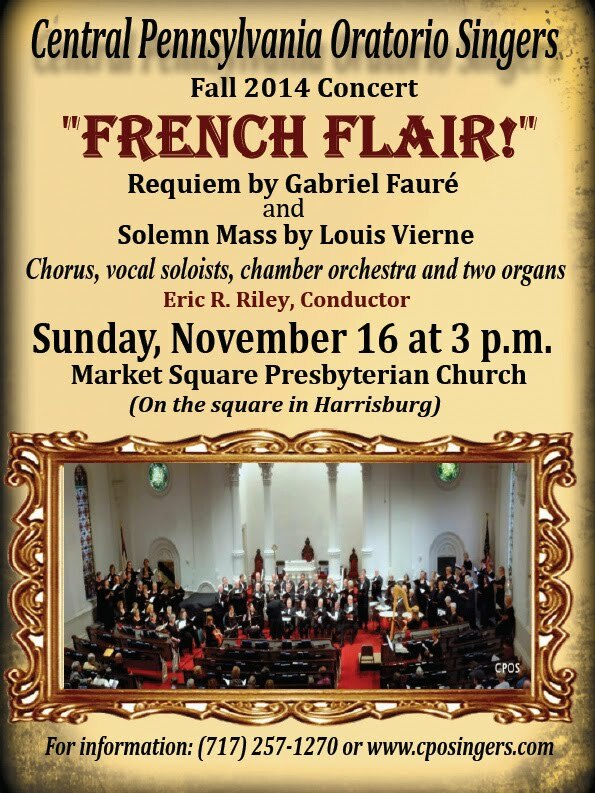 Fall 2014 Concert Announcement Central PA Oratorio Singers will perform French Flair! Requiem by Gabriel Fauré & Solemn Mass by Louis Vierne on Sunday, November 16, 2014 at 3:00 p.m. Being respectful of the material and having fun are not mutually exclusive! Visit the Audition request page to make arrangements with the director, if you would like to have "fun" with us! "The marvels of God are not rought forth from one's self / Rather, it is more like a chord, a sound that is played / The tone does not come out of the chord itself / but rather, through the touch of the musician / I am, of course, the lyre and harp of God's kindness." Read more about Hildegard of Bingen! A larger calendar is here - its iCal - cool, eh? Visit us on Facebook, and don't forget to "like" us to keep up-to-date with the latest happenings! Discover more about us by exploring the links on the left side of this page. We appreciate your interest, support, and also your Feedback. Sunday November 16 ~ 3:00 p.m.
Sunday November 17 ~ 3:00 p.m.
Read more about this Oratorio, and a note from Eric! 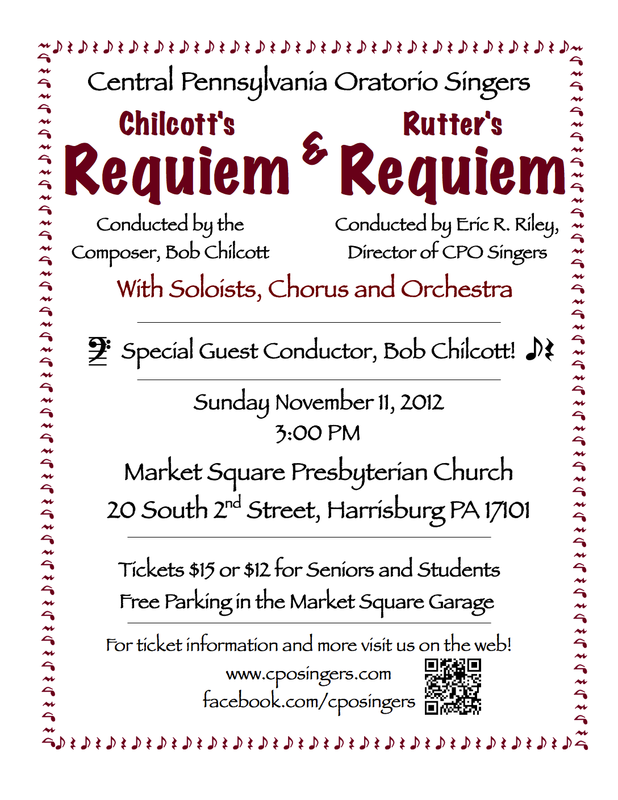 Sunday November 11, 3:00 p.m.
Click here to view the 2012 Concert Program! CPOS welcomes English composer Bob Chilcott as guest conductor! We are privileged to have Mr. Chilcott conduct the CPOS for his Requiem setting. Since one requiem is not enough, Eric R. Riley, Director of the CPOS, will conduct the first half of the concert, John Rutter's Requiem. Please click, print and share the announcement above. Thank you! Read more about the Requiem composers, Bob Chilcott and John Rutter.